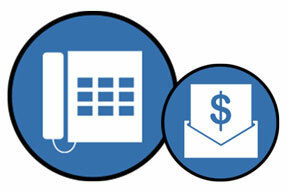 Marin Sanitary Service offers our customers a variety of convenient bill pay options. If you have questions about your bill, please call and ask to speak with someone in the billing department at (415) 456-2601 Monday through Friday, 8 a.m. to 5 p.m.
Make payments, set up automatic payments, and view payment history by logging into your Marin Sanitary Service account. Online payments can be made by credit card or e-check. Please note you will be leaving the MSS website and entering the secure Soft-Pak billing website. Read our Online Bill Pay Instructions. As of February 2018, online bill payments will not work from a computer using Windows XP, Windows Vista or Windows Server 2003. To use our the Web Pal online bill pay program, you should use Windows 7, Windows 8, Windows 10, Server 2008 or S erver 2012. Internet browsers should be updated to use the latest version of Internet Explorer/Edge before 2/12/18. If another browser is being used it should be updated to use the latest version available. Internet Explorer/Edge should be updated even if it’s not the default browser. More information can be found here. If you do not want to set-up an online bill pay account, you may use a credit card and pay over the phone to make payments on your account. MasterCard, Visa, American Express and Discover are accepted. Please call our office at (415) 456-2601, Monday through Friday between 8 a.m. and 5 p.m. to make a payment. If you choose to set MSS up as a vendor on your personal bank and pay through an electronic check it is important that you enter your complete account number including all zeros to ensure the payment is processed properly. All MSS accounts begin with 01 followed by 7 numbers in a row and an 8th number that comes after a space. For example, 01-0000123 1. All 10 numbers must be recorded in this format. Bill payments are accepted at our office by cash, check, or credit card. Our office is open Monday through Friday, 8 a.m. to 5 p.m.